Date formats - Tantramar Interactive Inc. Dates are complex. No question. To be handled carefully. In prose, spell out the month and use a 4-digit year: January 3rd, 2012, is unambiguous. 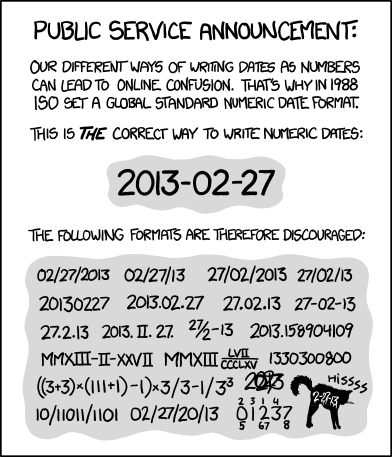 The problem with other date formats is that they represent different dates depending on where the reader is from. Think about that. If the way a date is formatted can reasonably be confused for the wrong day, what other job does it have? Britons read it as March 1st, 2012. Canadians? Since we’re influenced by our British heritage and our American neighbours, we might read it either way. This way madness lies (or, perhaps, the assumption that your content is stale or that you’re visiting from the future). Bonus: ISO 8601 date can be used in French and English (other date formats tend to be language-specific, and can sometimes be enforced by web content software). When discussing elapsed time in copy, avoid constructs like “Mary has 12 years’ experience…”; this form is a hold-over from the era of print-first, when documents’ effective lifespan was measured in months. Prefer “Mary has worked in the field since 2002…” This copy may exist online for years; why write something that will be out-dated in weeks or months?